Home / Entertainment / Politics / Antonio Trillanes will vacate his senate post soon - Should he re-enlist, go to Marawi and fight ISIS? Antonio Trillanes will vacate his senate post soon - Should he re-enlist, go to Marawi and fight ISIS? 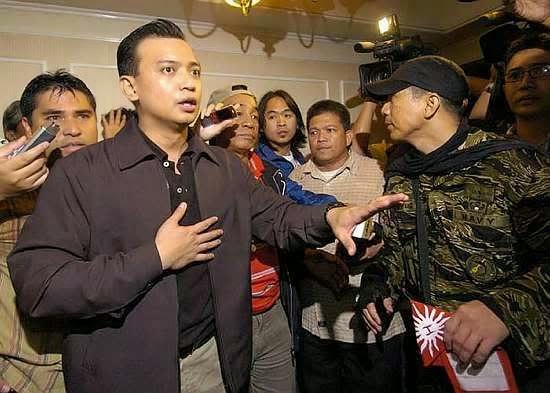 Since Antonio Trillanes will be vacating his senate post soon, I'm just wondering what he could use his extra time to be more productive and be what he projects to be in the public: A patriot that will fight for the freedom of the people, a brave soldier who will never falter and a politiko who is more than what his mouth utters. The entire Filipino nation knows that neither of the descriptions above rightfully fits of what Antonio Trillanes is really made of. He's a coward, a rice soldier who mounted two coup attempts that lasted for only a day, leaving our economy crumbling. A filthy politico, whose allegiance and loyalty depends on whoever has the money. A failure who went apart when faced with the reality that his rhetoric against the Duterte administration is simply 'out of tune' with the general sentiments of the Filipino public. Should Trillanes re-enlist in the armed forces and go to Marawi and fight the ISIS-linked Maute terrorist group? Does he have the balls to do it? Does he even know how to use and fire a gun? These are the biggest mysteries about the washout that is Antonio Trillanes.